Canadian companies have to first understand the federal government definition of productivity. Most of us view labour productivity by how much we get done each day. We talk about our business productivity as it relates to employee productivity through the lens of getting critical work done. For governments and economists, using technology to increase labour productivity needs definable metrics. Before delving into actual measures, consider this productivity quote: “1. Automation applied to an efficient operation will magnify the efficiency. 2. Automation applied to an inefficient operation will magnify the inefficiency.” Bill Gates The first thing to remember when considering productivity gains is that layering technology on top of an inefficient system will only make things worse, not better. So how is productivity defined? 1. Value added per employee For the purposes of the Canadian government, the productivity calculation is as a function of profit per employee to arrive at the value added per employee or VAPE calculation: Earnings Before Interest, Taxes, Depreciation, Amortization (EBITDA) + Salaries/Full time employees = VAPE What is important to note is that this is only one measure of productivity – measuring the increase in profit or EBITDA. This measure alone is too narrow to define business production. 2. Return on Investment Businesses also have to measure productivity against the return on investment (ROI) for a particular technology investment. Typically, the time horizon for a technology investment would measure the cost of the investment less the gain/cost compared over a period of time. If the investment can pay for itself over a defined time period, then a positive or neutral ROI combined with other factors makes the investment worthwhile. 3. Cost versus Flow Another way to improve the productivity formula is to consider how new technology affects overall operations. For example, a technology can reduce input cost which affects EBITDA by increasing profitability. Cost items include reducing re-work, waste & non-value added activities. But EBITDA can also be positively impacted by operational flow. An increase in production flow would include the cost items mentioned above but also includes increased output, improved quality, and decreased lead time. Increases in flow can have more impact on productivity because flow increases sales and customer retention over time. While the federal government must have concrete and definable measure such as VAPE, using a more holistic approach including ROI and cost/flow measures of productivity will have more impact as Canadian industry works to create a resilient and globally competitive digital economy. We recommend using a combination of VAPE, ROI and cost/flow to determine whether your business should adopt a new technology. 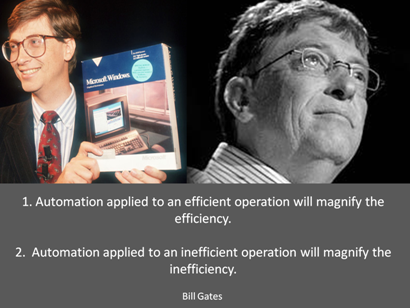 And technology isn’t always the answer – adopting efficient systems still comes first! What measures does your business use for productivity; VAPE, ROI or cost/flow? Terry Rachwalski works in Canadian Management Consulting who delivers productivity services services. She spoke at NRC sponsored workshop in spring 2013. Click here to see her slide show Increasing Productivity via Technology Utilization _____________________________________________________ The Canadian National Research Council (NRC) introduced the Digital Technology Adoption Pilot Program or DTAPP. The purpose of the program is to align programs with the federal government strategy to build a competitive digital economy. (Updated March 2014) BLOG UPDATE: The NRC DTAPP program was suspended in March 2014. However, NRC continues to work to support Digital Technology Adoption Resources. While funding directly through DTAPP is not available, we encourage companies to contact their local ITA to learn more about productivity resources for Canadian firms. The DTAPP program was to assist Canadian business adapt to the rapidly changing digital world. NRC offered grants to Canadian companies to help them understand and make the leap to invest in new technology that will make them more productive and competitive globally. Digital Advisory Services or DAS grants were part of the DTAPP offering administered by the Canadian Association of Management Consultants. This joint program with CMC-Canada and NRC helped NRC clients wade through their productivity and technology options with the assistance of a certified management consultant from Canada. Thanks Terry! I didn’t know anything about the DTAPP program; it sounds like the Canadian government is taking a strong approach to a knowledge based industry. They are – I see it as a subtle switch from pure research to supporting global competitiveness. The more competitive we are in the world, the more we can also support pure research which is a critical success factor to a knowledge economy. Thanks for the comment.